Huzzah! Huzzah! The soda siphon has arrived! Time for a round of Fizzes and Collinses! First up, one of two quintessential New Orleans cocktails, the Ramos Gin Fizz, also known as the New Orleans Fizz, depending on whom you ask. According to David Wondrich, New Orleans was experiencing an enormous boost in tourism in the 1890s, its “historic” saloons (in reality no more than a dozen years old) profiting immensely from visitors seeking refreshment. Henry Charles “Carl” Ramos was heading up the drink program at the Imperial Cabinet Saloon and winning over entire crowds of people with his special house fizz, dubbed the “One and Only One” by him. 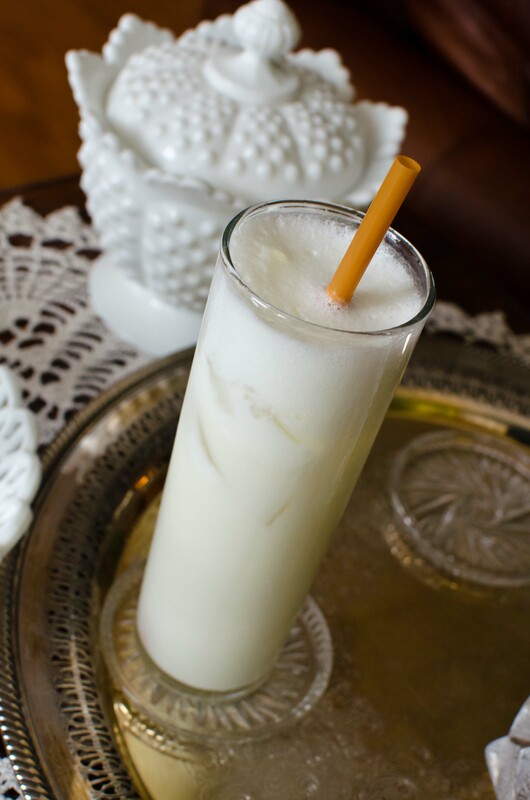 By 1900, the Kansas City Star was calling it “unequaled.” Wondrich mentions that each of Ramos’s six bartenders was accompanied by a “shaker boy,” whose sole purpose and reason for employment was the shaking of the Ramos Gin Fizz. Estimates and accounts of the time say it took anywhere from one minute to fifteen minutes (!) to shake up one of these drinks. Shake all ingredients without ice for about a minute. Add ice and shake for at least another minute, minimum. Shake longer if you’re up to it! Pour into a Collins glass or similar tall glass, alternating the pour with spritzes of soda water (totaling 1 to 2 ounces, to taste; the drink isn’t actually meant to fizz). Fill with ice if needed, and while this step is not preferred, it doesn’t hurt the drink’s taste. Ah, splendid! A very creamy, very smooth consistency. This version is not as subtle or mild as the one I made several years ago (yes, it’s been a while), and I think that is an improvement. The citrus is certainly not overwhelming, and the blending of lemon and lime, a curious trend in the late 1800s, softens both of the fruits; I generally find lime to powerful and lemon to sour when used on their own. The orange flower water actually comes through in the nose, and offers a subtle kick in the flavor. Plymouth would be a wonderful gin to use here, but you may add 1/4 to 1/2 an ounce of simple syrup to make up for the sweetness lost in not using Old Tom. I’ll have to try this out again with Ransom Old Tom. David Embury, in The Fine Art of Mixing Drinks, differentiates between the New Orleans Gin Fizz and the Ramos Gin Fizz, the latter being the “Same as the New Orleans Fizz, but with the addition of 1/2 to 1 teaspoonful Eau de Fleurs d’Oranger.” That’s a heavy dosage! Add in 4 drops or 1 dash, an certainly no more than a quarter teaspoon. 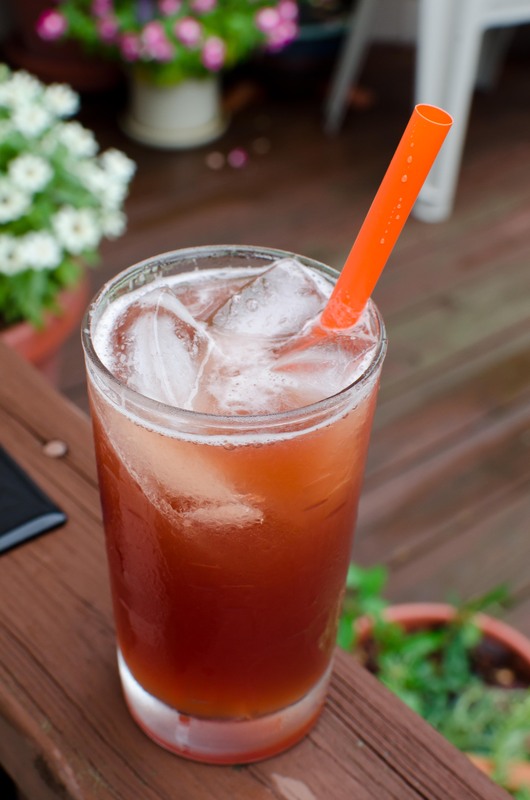 Additional recipes for this drink alter the amounts of cream and sugar, for the most part, and are essentially identical the the one given above. Check out Jay Hepburn’s post, Paul Clarke’s post and article, Darcy O’Neil’s post, and David Wondrich’s Esquire article for more, not to mention Robert Hess’s video and recipe, though, as I warned you, the recipes greatly resemble one another, a remarkable feat in the history of cocktail recipe compilation! Merchant in Madison, WI uses a vanilla-infused simple syrup in the Ramos, a wonderful addition I mimicked with the Bittercube Cherry Bark Vanilla bitters. The guys at Merchant do an amazing job of getting the meringue to build up in the glass, as well (never order the Ramos when the bartender’s busy!). Shake everything but the soda with ice. Strain into an ice-filled Fizz, Delmonico, or Collins glass and top with the soda water, stirring once to combine. Garnish with a lemon or orange wedge, if you wish. Jason Wilson (Boozehound) recommends substituting 2 dashes of Angostura Bitters for the simple syrup if you feel like a drink that is less sweet. Taking a cue from the Ramos Fizz, I used a blend of lemon and lime to wonderful effect: the softening of both citrus juices works its magic. In previous versions, I found that lemon alone is too sour for my taste, though I hated the though of adding more sugar. Simple and excellent, especially if you enjoy Plymouth Sloe Gin as much as I do. 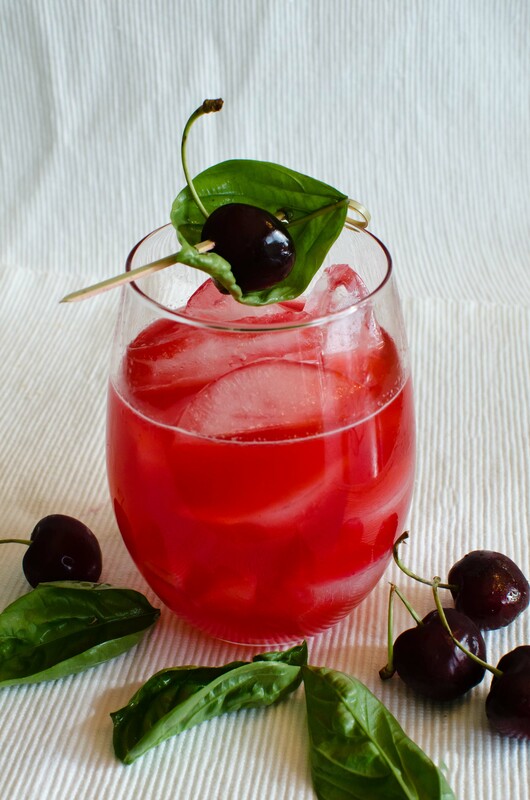 Muddle cherries (the pits will be strained out) and basil, add additional ingredients and ice, then shake and fine strain into an ice-filled Collins glass. Top with about 2 ounces of soda water and stir to combine. Garnish with a cherry, a basil leaf, and a lemon wedge. Hmm, not bad, not bad, and refreshingly light. I infrequently partake of vodka drinks, and this one does not surprise me much in terms of what it tastes like. The basil and cherries do make a surprising combination, though! Something like mint would have been to sharp in this case. Summertime here means fresh basil from our garden; I’m thinking it needs to find its way into more of my drinks. I wish the cherries would come through a bit more…maybe a dash of Cherry Heering could be added? The color, of course, is gorgeous. Check out the newest episode of “Liquid Kitchen” to see Kathy mix one up. While Ransom Old Tom would no doubt make a good Ramos Gin Fizz I am not sure I would want to use it here where its wonderful qualities could get lost. If not drinking it on the rocks I tend to save it for a drink where I find it can really stand out like a Martinez. Very true. It would be an interesting experiment, and I only suggested it because it’s one of two Old Toms that I have. I’ve yet to try Ransom in a Martinez, and I can see it working wonderfully. Thanks! Tried the Ransom in a Martinez the other day (the first drink to use it), and it was wonderful! This entry was posted on July 30, 2011 by IJ Lauer in Drink Recipe, Eggs, Gin, Old Tom Gin, Sloe Gin, Vodka and tagged basil, cherries, cherry basil collins, cream, drink recipe, fizz, lemon, lime, orange flower water, ramos gin fizz, recipe, sloe gin, sloe gin fizz.